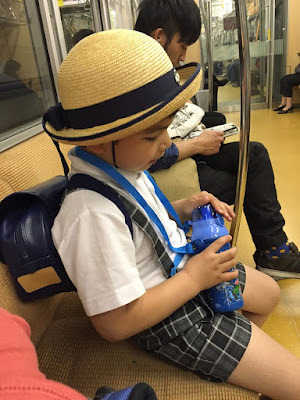 Seven years ago, when we lived in Japan, Sky's Japanese preschool and its amazing teachers went a long way in helping me figure out how to parent Sky at a time when I had no idea how to deal with him. He was not yet diagnosed with autism spectrum disorder, so we had no idea why he was so difficult. The school gave Sky his first positive group experience where he was loved and accepted by his peers (link). 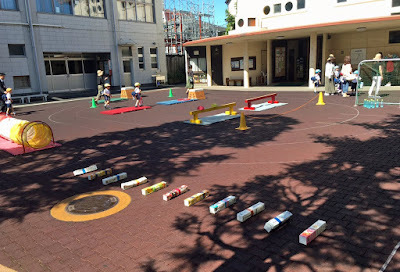 The hardest part about leaving Japan back then was taking Sky out of that school. I'd always wanted to give Pink and Stow the same experience. Not only does sending the kids to preschool in Japan help them make friends, it's also great for their Japanese and helpful in letting them see a whole different approach to early child education (which they might not understand but which I think probably helps them be more open and resilient). For years, I'd been hoping to get back to Japan for a summer when Pink or Stow were the right ages (3-5 years old) to attend the school. This summer, FINALLY, the timing worked. 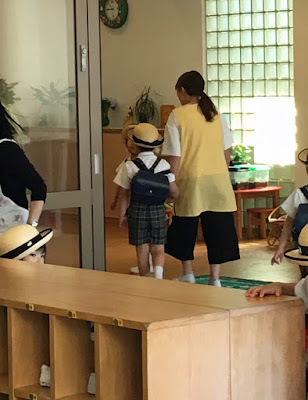 Stow heading off to his first day of preschool. It's weird to be given a chance to have seven years of critical distance before returning to an old, familiar, and once significant setting. When Sky was going to the school, life was tough. We were overwhelmed by his meltdowns, his impulsivity, his inability to follow directions. Many days I dropped him off with tears in my eyes because the 5-block commute to school was so grueling. Most days, I feared the school would call and tell me he had to leave because he was causing so much trouble. (For the record, this NEVER happened in Japan. 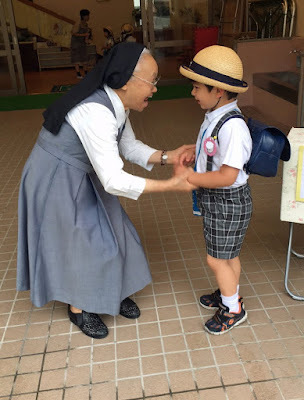 The teachers were always endlessly patient, always working to figure out how to make school work for him. It did, however, happen to Sky on multiple occasions in more than one school in the US). Sky's Japanese preschool most likely saved us at a time we really needed saving. So much has stayed the same at the preschool over the past seven years. The school uniforms and drop off and pick up routines are the same. Many of the same teachers are there, and they don't seem to have aged a day. 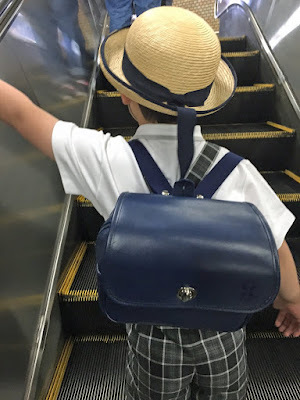 I was rusty remembering which things Stow had to take to school when, which days were early pick-up, and on which days he needed to wear his PE uniform (link). Still, I wasn't nearly as overwhelmed by it all as I was seven years ago. Fridays are "Sports Day." Doesn't this look like fun? Some things were A LOT easier. Stow never refused to go to school, always agreeably put on his uniform, and never pulled on my hand or darted away from me. 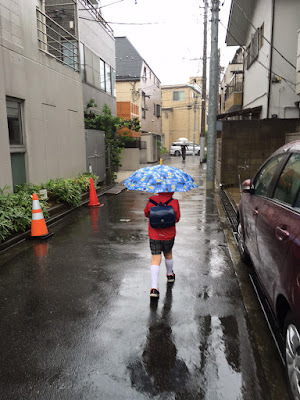 Trips to school on rainy days never resulted in me becoming totally drenched from dumped umbrellas and puddle splashes. The teachers who knew Sky all noted how much easier it was for Stow to make the adjustment. Some things were harder. Stow wasn't at the school long enough to become proficient enough in Japanese to feel confident in his friendships. Though he left each morning excited to go to school, he got tired before the end of the day and often cried to go home. 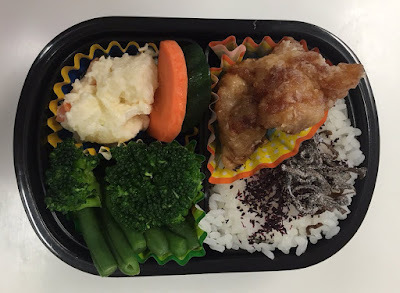 And, since he has allergies and is gluten- and dairy-free, I had to enter the bento wars on a daily basis (link) instead of being able to take advantage of the two days of school lunches the other kids enjoyed. 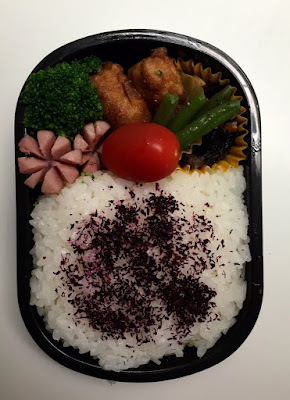 Much easier to make good bento when you have good ingredients. 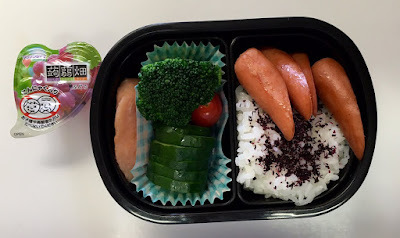 Ren's bento still look better. I just can't figure it out! 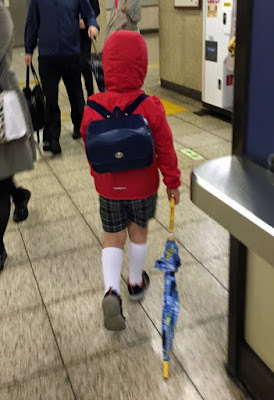 The hardest part this trip was the extended regression Stow seemed to experience while we were in Japan. I'll write more about THAT later, but I do know that the school was most likely not the cause, and that, in all likelihood, our ability to send Stow to school each day made the month easier for everyone. Saying goodbye on his last day. It's hard to describe what it's like to find a place that accepts and loves your kids for who they are no matter what their struggles. It's amazing. It's heartwarming. It's an unbelievable relief. Wouldn't it be great if there were more places like this?